This is a very yummy chocolate cake. 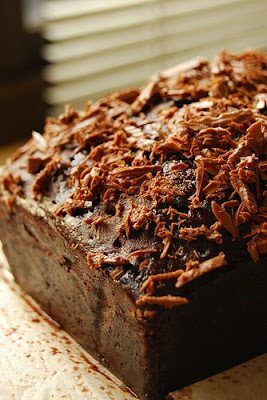 Moist, chocolaty, dense, – and I think it goes without saying, decadent. I think the best parts of this cake were the areas where the syrup reached the cake – OH MY – extra moist and the flavor was so deep and perfect. Thank you Nigella. Equipment: Loaf pan – approximately 9.5 x 4.5 x 3 inches, lined with greased foil, overhanging at the top. Preheat oven to 325F and place baking sheet on middle rack. In processor, add flour, baking soda, cocoa, sugar, butter, eggs, vanilla, and sour cream – blitz until smooth. Scrape down batter and process again while pouring boiling water down the funnel. Turn off, remove lid and add chocolate chips, using spatula to combine. Pour batter into prepared loaf pan and place on baking sheet in the oven; cook for about 1 hour. The cake will be done when the loaf has risen, split down the middle, and a cake tester comes out fairly clean. About 10 minutes before the cake should be done, put the syrup ingredients into a small saucepan and boil for 5 minutes (it won’t thicken much). When the cake is done, place it on a cooling rack (still in the pan) and pierce here and there using a kabob skewer, cake tester, or chop stick. Pour the syrup over the cake, letting it soak in. Allow the cake to come to room temperature, then remove it from the pan and remove the foil. Sprinkle generously with chocolate garnish.